As the new year approaches, now is the perfect time to set new goals for yourself for the upcoming year. What better time than now to recommit to your oral health? As the new year starts, make better dental health part of your New Year’s resolutions. As your family dentist in Cleburne, we have the simple and effective tips you need to promote your oral health throughout the upcoming year. You will make a true investment in your quality of life with better oral health. The path to better dental health starts at home with your oral hygiene routine. You need to brush your teeth twice a day for two minutes each time. Use a soft-bristled toothbrush and fluoride toothpaste to clean all surfaces of your teeth. By doing so, you will remove trapped food particles, plaque, and tarter to prevent gum disease and tooth decay for a healthy smile. 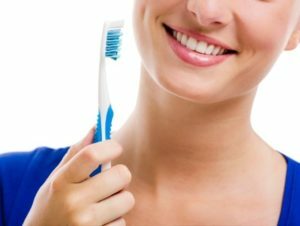 Even with the best brushing, there are still trapped food particles and plaque between your teeth and around your gum line. If you do not floss each day, bacteria found in plaque will cause the gums to become infected, which is known as gum disease. Use an ADA approved dental floss to clean in between each tooth. It does not matter if you floss in the morning or at night, but most tend to prefer flossing at night after they have brushed their teeth. Your home oral hygiene is only half of the care you need for superior dental health. You need to visit your dentist twice a year for preventive and diagnostic care. Every six months, you need to have your teeth professionally cleaned to remove plaque and tarter that has not been removed with brushing and flossing. In addition to a cleaning, we will also perform a comprehensive checkup of your oral health. We will evaluate the current health of your teeth and gums to look for any areas of concern. With early detection, we provide prompt treatments and interventions to prevent future damage. As a result, you will ensure your teeth and gums stay healthy while keeping future dental costs and procedures to a minimum. We have all heard the saying, “you are what you eat.” This saying is true for your teeth as well. The foods you eat impact your oral health. You need to limit your consumption of sugar and starches to reduce your risk for tooth decay. Choose foods that contain proper amounts of vitamins and minerals to ensure your teeth are strong and healthy. With the right diet, you will give your teeth the foundation they need to prevent dental problems. As the new year begins, commit to your oral health for a beautiful, healthy smile all year long. Long Family Dental offers the preventive care you need to protect your oral health. Contact our office today to schedule a consultation.